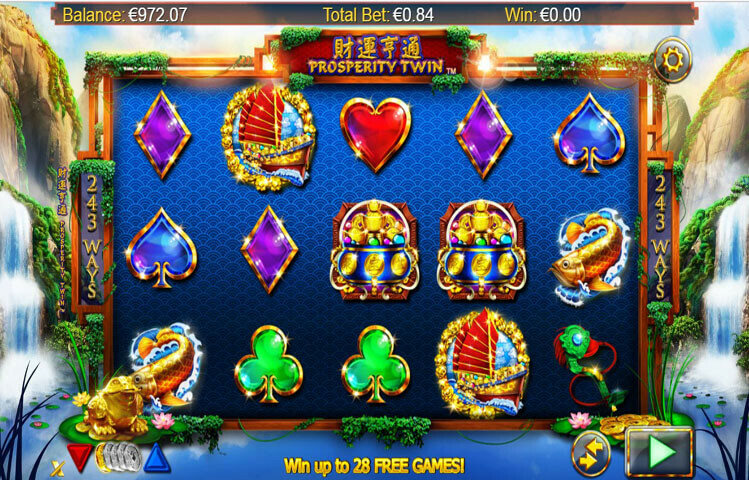 Prosperity Twin is one of the amazing games by Next Gen Gaming. This slot game has a 5 reeled setup that is home to 243 ways to win. This means that the game is much more rewarding than the usual slots that come with a limited number of lines. The game has a Chinese theme that come with multiple bonus features and icons. So players better be on the lookout for the wild multiplier that can give winnings up to 8x. There is also a free spins round that gives players up to 28 free spins. Play the game here for free and see what it has to offer prior to placing real money stakes at online casinos. Prosperity Twin by Next Gen Gaming has a smooth game play that is easy for even the novice players. This is because the control panel is clear and everything is laid out in a way to make it easy for the players. They can easily place the bets, spin the reels and view the payouts table. The game has a tranquil and a soothing feel to it, which fits greatly with the Asian Chinese theme. This is why players will be taken into the most relaxing places on earth. They will see a waterfall in the reel’s background with a golden frog. As for the symbols that players will see spinning across the game’s reel and lines, they are inspired by the Chinese culture. These icons include golden coins, a space, hearts, diamonds, clubs, dragon toys, golden hats, golden fish and abacus. The highest paying symbol that the game has is the Gem Stuffed Chinese junk. This symbol can give players 288x the placed wager when they get 5 of a kind of this symbol. Prosperity Twin has the power of Next Gen Gaming behind it. This is why players can expect to find plenty of special features and winning chances. The first of these special features is the wild icon. This wild icon is the 3 golden coins symbol. This wild can help create winnings and boost them. The wild will replace any other icons on the reels, except the scatter. It can also multiply these winnings by a random multiplier from x2 to x8. As for the other special icon, which is the scatter, it comes in the form of the Chinese letter icons. Three of these icons landing anywhere on the slot’s reels would trigger the free games round. Players will be able to claim from 8 up to 28 free games when they get from 3 up to 5 scatter icons on the reels. Players will also get to claim scatter pays with these free games.